Peter Nyberg is talking with Anisur Rahman on the National Poetry Festival in Bangladesh in February 2015. What do National Poetry Council in Bangladesh do? The National Poetry Council of Bangladesh was founded by Poet Shamsur Rahman (1929-2006) along with his fellow peers in favour human progress, solidarity, secularism and democracy in 1987. It was a protest against military regime. It began with its introduction of the National Poetry Festival in the same year. Now its tasks include hosting country’s biggest poetry festival, supporting poetry festivals in different cities and towns in Bangladesh, promoting literary exchanges with different countries for instance India, Nepal, Sri Lanka, South Korea, UK, USA, Sweden, Germany, Australia, Japan, China, initiating literary publications, celebrating national and international cultural occasions and commemorating birth and death anniversaries of important Bengali poets. 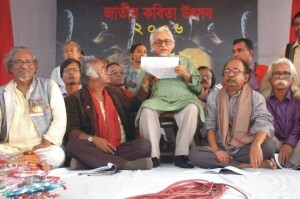 Poetry Council is the biggest literary body of Bangladesh. If we want to present it in Swedish contexts, its role can be compared with that of the Swedish Writers Union. What are the Bangla Academy? The Bangla Academy is the preeminent learned body for the promotion of the Bengali language, and Bangladesh’s national language authority. Established in 1954, it is located in Burdwan House in Ramna, Dhaka, within the grounds of the University of Dhaka and Suhrawardy Udyan. The main task of the Academy is to conduct research on Bengali language, culture and history, and to publish Bengali literary and research work. 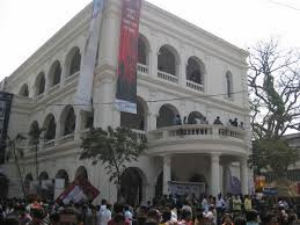 It has also established the Bangla Academy Award, given each year for contribution to Bengali language. To commemorate the Language movement and the Language martyr’s day, the Academy organises the month-long Ekushey Book Fair, the largest book fair in the country. How many people use to participate in the book feast? How many visit it? Some thousands people take part in different programs like seminar, reading, discussion, music, dance, book launch during the month long book fair beginning on February 1 every year. The fair aims at commemorating the UNESCO International Mother Language Day February 21. During the fair, Bangla Academy announces the Bangla Academy Literature Award, the highest literary recognition in Bangladesh. Some hundreds people take part all these activities at the fair every day. Some 3000 books are published on the occasion of the fair. Nearly 2 million people visit the fair every year. Free entrance to the fair. What do the National Poetry Festival mean to Bangladesh as a poetry nation? 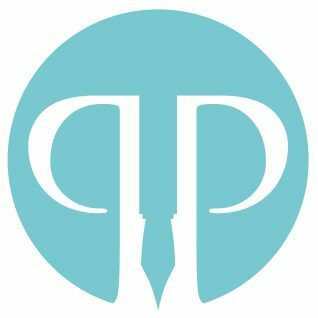 It is the national and main platform for poets of the country. Not only the poets and poetry readers but also the public and politicians look forward to this cultural event. From working class people to cabinet ministers, parliaments members, diplomats, academic and students attend the event to listen to poets from Bangladesh and other countries. Nearly 500 poets read their poems at this event. Give some hints on what should be seen and done on a trip to the Poetry Festival? You can make a visit to: National Museum of Bangladesh, Liberation War Museum, Bangabandhu Sheikh Mujibur Rahman Museum, The Old Dhaka’s Bangla Bazar area where all publishers and book industries locate, Purana Paltan where most graphic houses locate, Bookshops at the New Market, Aziz Super Market, Shahbag, Dhaka University Library, Public Library, International Mother Language Monument (Shaheed Minar). Do you have any idea on how the Bengali poetry and the Swedish poetry differ?